This beautiful property is a must-see! 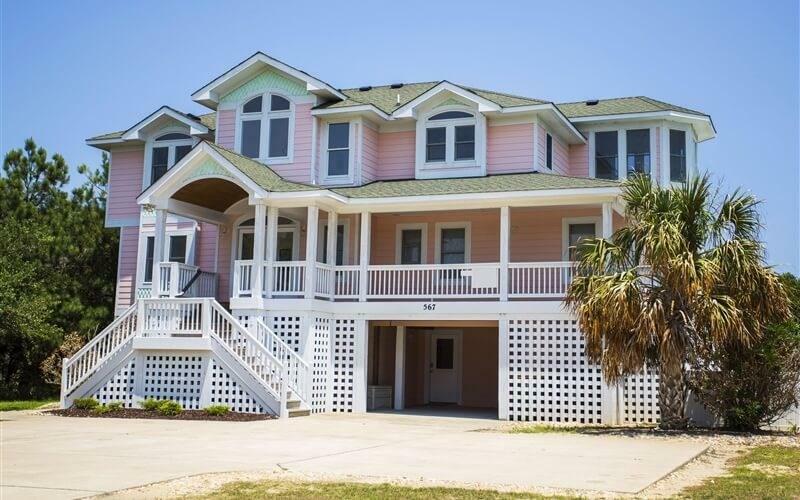 Meticulously maintained and well-thought-out, Coral Reef is one of Corolla's finest ocean side homes. The effective age is like new. Spacious open floor plan, inviting and packed with amenities such as the elevator, there is no need to lug groceries to the top level. The home has been freshly painted with new luxury vinyl tile, hardwood floors have just been refinished, 6 extra large master bedrooms. On the top floor the Kitchen has gorgeous maple cabinets with granite counter tops, stainless steel appliances, 2 dishwashers, range & fridge with ice maker. Open spacious great room with gas fireplace and large windows to enjoy the views. The dining room is also included with a large dining room table, and a bonus lofted sitting area. The Master bedroom has a jacuzzi tub and separate shower, his and hers sinks. Plus private entrance to outside sun deck. Mid-level features an extra large laundry room with linen closet, wrap around decks and 4 king bedrooms. Proven rentals over $70K annually and should do $80K with the new upgrades. Ground floor Rec room includes wet bar, pool table and easy entrance to the outdoor heated swimming pool, new hot tub and expansive back yard. X flood zone, no flood insurance required. Call your investors and second homeowners because this is the home for them. Home is pet friendly, has water filtration system with chlorinator and has recently installed a heater for the pool in order to generate better rentals, along with replacing all the bedding with Tommy Bahama comforters & spreads. From this central location, enjoy convenient shops, restaurants and activities available in Corolla and further south in the town of Duck. 2 new HVAC's and convection oven installed in Nov 2018. New in 2019 hardwood floors refinished and water treatment system.